I come from a family of Realtors, where I learned from the best - my mother. 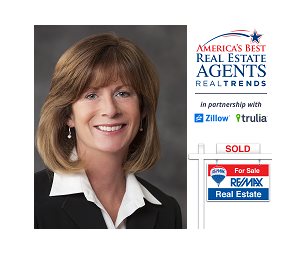 Margaret Ryan was the top agent in the Aurora for many years, retiring after 40 years listing and selling homes. I was born and raised in Aurora and began selling real estate in 1988. My husband and I live in the Aurora University neighborhood, where we have raised our children and resided for over 30 years. I am a proud member of the Re/Max Hall of Fame. I have been named in Chicago Magazine for the past six years as a "Five Star Agent". Five Star Agents are a select group, representing less than two percent of agents in the area, and are chosen by satisfied past clients. I rank among the nation's top real estate agents in the respected REAL Trends "The Thousand" survey, featured in The Wall Street Journal. I have been involved with many organizations over the years. Currently, I volunteer at the Holy Angels Food Pantry and Hesed House. I sit on the board of directors at The Healy Chapel Funeral Home and am a member of the Tuesday Garden Club.